I wrote an article on the rapture and how it fails to reconcile suffering with biblical theology. The New Oxford Review picked it up. 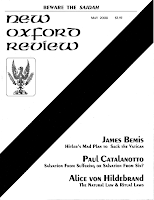 I never thought that my name would be on the same cover as Alice von Hildebrand. I haven't really looked at how they edited it, but I will say that what was published is considerably shorter than what I submitted, and from the brief skim I gave it, I think they managed to keep the necessary content in place in order for the reader to make sense of the argument. Apart from the obvious theological problems surrounding the idea of a rapture, as well as its sketchy, non-biblical origins, there is one issue about the rapture that is often overlooked or not considered by most Christian apologists and theologians: the rapture fails to reconcile suffering in Christian theology. Any casual reader of the Bible can easily see that suffering is an ongoing theme that is present in almost every book of the Bible, that suffering plays a crucial component in biblical theology. The rapture, however, does away with suffering, and therefore does not fit into biblical theology. Paul, this is impressive. When did you write this? What is this publication? Good work, Paul! So when do they start to print your "Not Said By Jesus" entries? I don't know LarryD, but it'd be great if someone did. It's good to see the truth about the Rapture getting out there. You should be proud.